Wind chills below 30 degrees didn’t stop hundreds of people from walking, biking and running across the new Oregon Inlet bridge Saturday before the long-awaited span opens for traffic, possibly by next week. 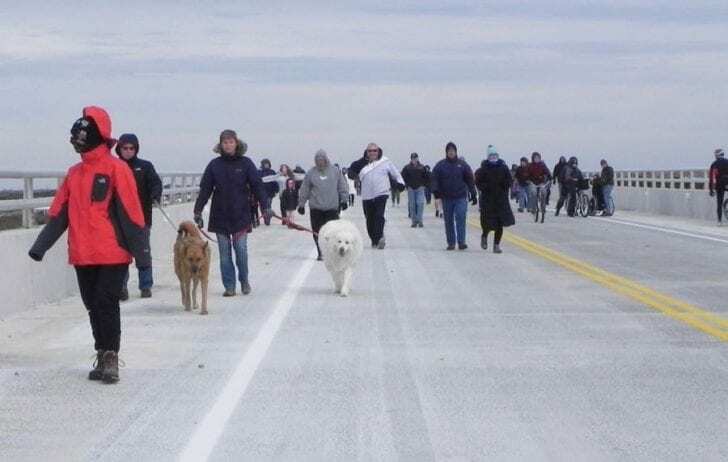 Many hardy souls, some walking dogs and others pushing baby strollers, started the trek as various local officials inside a packed tent at Oregon Inlet Fishing Center touted the new span and offered a little of the history behind it. “I will say this really is an engineering marvel,” said David Hallac, superintendent of the Cape Hatteras National Seashore and chief of National Park Service facilities on the Outer Banks. “I’ve had the pleasure of working with the Department of Transportation and being briefed on construction and demolition plans. And every time I’ve finished those meetings, I say this bridge clearly, the construction of this bridge, clearly is not rocket science. 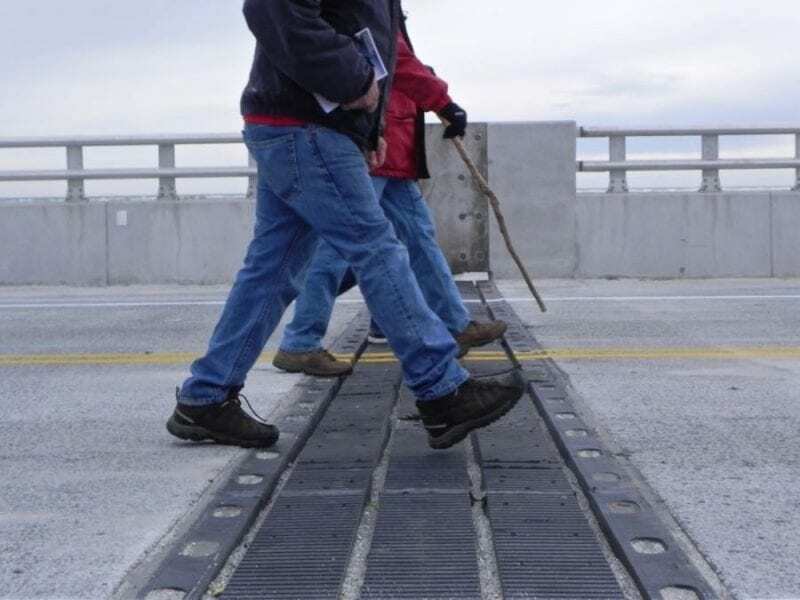 The new 2.8-mile-long bridge dwarfs the old one with soaring navigation spans carrying the roadway 90 feet above Oregon Inlet. After 30 years of planning and legal battles, the Bonner Bridge Replacement Project began in March 2016 at a cost of $252 million. It is designed to last 100 years. State highway officials are on track to name the new bridge after longtime state Senate leader Marc Basnight. If the state Board of Transportation approves the designation next month, the remaining section of the old bridge, which will be used as a fishing pier after the rest is torn down, would keep the name Herbert C. Bonner. I walked the bridge. 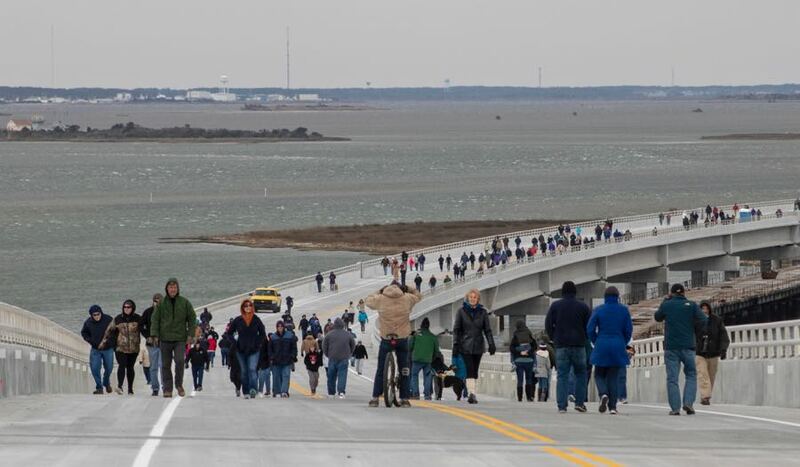 It’s too bad with all of the various NCDOT, Park Service, Dare County folks who were present that no one bothered to actually count the walkers. Oh. look Oregon inlet bridge like the way the majority of the OBX voted for anyone who supports democracy would be for that name. Thanks too TW’s Bait and Tackle for calling the bridge in their article it’s true and rightful name !!! C’mon people 😂. Should’ve been named the Bonner Basnight Oregon Inlet Bridge. That would’ve covered all the bases! I’m outraged and peed off. Anyway, the 💰 has spoken. 🍺 O clock is just around the corner. Koo Flocks out. Wonderful time walking the new bridge today.